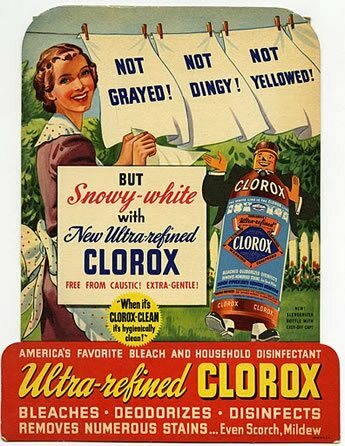 After a thorough search, The Clorox Company hired Marian Calabro of CorporateHistory.net to research our history, interview people, and write our centennial history book. She was fabulous! I seldom recommend people, but I recommend Marian Calabro highly. On every continent, Clorox stands for a cleaner world and healthier homes. It was an honor for Marian Calabro to research and write Clorox’s first-ever history book, published in English and Spanish language versions for the 2013 centennial. CorporateHistory.net also wrote The Clorox’s Company’s heritage timeline. What a treat to comb through thousands of pages of oral history interviews from the early 1980s. These were done for a 75th anniversary book that was never written. Luckily Clorox archived all the transcripts. Some interviewees were almost 100 years old then. Their voices jumped off the page, giving me first-person glimpses of company founders and all kinds of juicy details that rarely show up more formal documents. Centennial CEO Don Knauss was one of the most fascinating corporate chiefs I’ve ever met. Don is an ex-Marine who has the distinction of being first Fortune 500 CEO to address the Out & Equal Workplace Summit. (Clorox is committed to diversity both as a workplace practice and a business imperative.) Don’s leadership role models are Dwight D. Eisenhower for integrity, Marie Curie for curiosity, Colin Powell for optimism, Eleanor Roosevelt for compassion, and Mohandas Gandhi for humility. Quite a list! 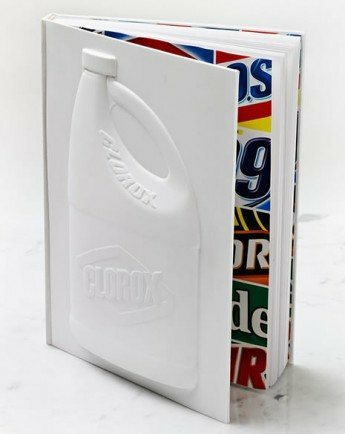 In conceptualizing and designing The Clorox Company: 100 Years, 1000 Reasons, Morla Design chose to have the book embody, quite literally, the iconic bottle. The vacuum-formed cover was created out of a bas relief die, with input from the Clorox engineering staff to insure accuracy. Collaborating with author Marian Calabro of CorporateHistory.net, Morla created a 200-page book that draws extensively on images, quotes, and letters. Butch, the fellow in the bottle, was the company mascot for decades. The Clorox Company’s centennial history is rich with images like this.